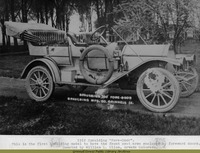 Spaulding cars under construction ; the right-hand steering means the cars in this undated photo are 1912 or earlier models. 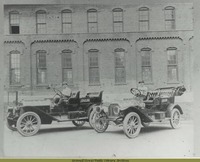 Spaulding cars parked on the north side of the Spaulding factory with automobiles. 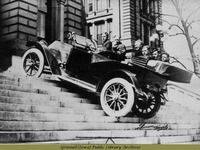 Two Spaulding automobiles, with drivers, are parked on the north side of the Spaulding Manufacturing Co., Grinnell, Iowa.